I am always on the hunt for weeknight dinner ideas that take less than 30 minutes to make and are largely hands off. Anyone with young kids is no stranger to the evening scramble of dinners, baths, possible homework (not necessarily in that order), and whatever else a few hours post daycare/school bring. These days, we’re not really eating as a family. Avi is too distracted and is resisting sitting down with us most nights. I’ll feed him earlier, picnic-style, on a tray situated on the floor. Whatever works, right? Whatever gets them to eat. But since the new year, I’ve tried to sit down to dinner before we start the bedtime routine (which can take up to two hours! ), which means that dinners must be truly quick and easy. Folks, I present you with Exhibit A: this slow-roasted salmon, which will surely enter into my regular cooking repertoire, and dare I suggest it enter yours, too? The recipe comes from the cookbook that broke the internet (or rather a cookie from it did, but more on that cookie another time) by Alison Roman, Dining In. While the method appeared some years ago in Bon Appétit magazine, I somehow missed it, so its wonders are all new to me. I made it last night, and I am now planning to make it next week, and possibly every week thereafter. The premise is simple: slow-roast the salmon in a vat of olive oil, which will render it tender, moist, and silky. While the salmon cooks, underneath a delicious blanket of sliced citrus and herbs, you can make a salad (in addition to the herb salad below) or play “trains and tunnels”* with your tiny human, or pour yourself a glass of wine, because, it’s been a long day, and, friend, you earned it. *trains and tunnels is a game made up by Avi, wherein you shape your hand into an arc (that would be the tunnel), place is on an arm of a sofa, and Avi runs his trains through said “tunnel”. This is a great weeknight dinner option—or dinner party main course—because it comes together with minimal effort, is delicious, and looks and tastes more impressive than actual work put into it. In other words—it’s what I like to call a “holy grail” of dinner recipes. However, it is a lot of oil to use just once, so my solution has been to save the oil post meal, strain it, and use it for salad dressing, roasting vegetables, and adding to simmering grains (I always like to add a slick of oil for to make the grains taste richer). Just transfer the oil to a separate, labeled jar; it should keep fine for a couple of weeks. Preheat the oven to 300°F (~150°C). 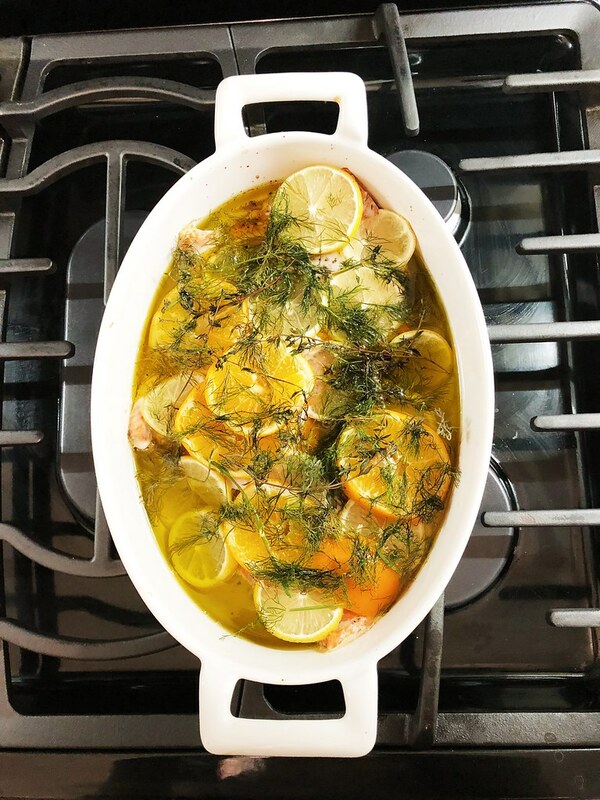 Season the salmon with kosher salt and pepper on both sides and place it in a large baking dish with the sliced lemons, oranges, and herb sprigs. Drizzle the olive oil over everything and place the baking dish in the oven. Cook 20-25 minutes, until the salmon is just starting to turn opaque around the edges and is nearly cooked through. Toss the herbs with the lemon juice and flaky sea salt, and serve along salmon. I’ve got salmon in the fridge for tonight, so this looks good! But what happens to the olive oil? I’m assuming you lift and drain the salmon? That’s a LOT of olive oil to throw away. Just wondering what the original recipe suggested? I’m wondering about the olive oil too. I special order my olive oil from California (lucero) and it’s a little pricy, but worth it. Wouldn’t want to waste it! Elizabeth and Marianne A – I am going to use the oil again in roasting vegetables, sautéing, or making a quick dressing. I definitely won’t waste. I’ll add that to the headnote as it’s a great question and I should’ve suggested it. The recipe didn’t suggest what to do with so much oil longterm. This looks amazing Olga! I’ve never tried salmon with olive oil but I must after this recipe! !